We couldn’t resist getting in on the April Fool’s action with our very own brand new pay-per-view model at The Next Web, and to keep the fun going, we’ve decided to put together a list of the best pranks that we’ve spotted around the Web so far. Google got a head start on everyone, and we’ve already got a roundup of all of this year’s pranks courtesy of the company, but what is everyone else up to this fine April Fools’ day? If you head over to Mashable right now, you’ll find the site’s logo has been adorned with the ultimate Team Coco symbol – a mop of red hair. Pretty much everything on the site is now a bright shade of orange, and there’s a little tuft of hair in the corner of the screen, which reveals a rather startling image of Conan himself, popping up to greet Mashable readers. Cashmore’s face smiling out at Mashable’s Twitter users has been replaced by a far less smiley, and much more orange, image of Conan himself. 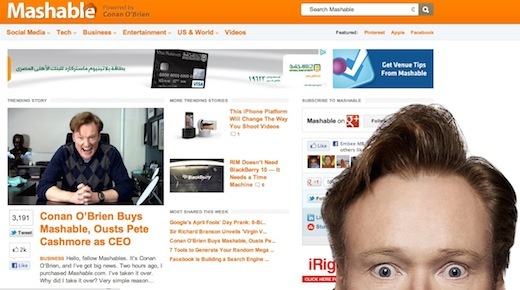 If Cashmore can literally be the face for a tech blog, then why not Conan right? To find out more about the April Fools’ ouster, check out Conan’s video introducing the news below. Electronic Hungry Hungry Hippos iPad Game is everything you remember about HHH. 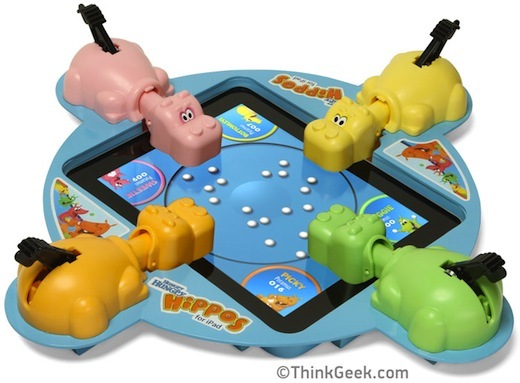 All four hippos are present and hungry, except this time, the hippos fit over your iPad and the game board is an app! Of course if you happen to hit the ‘Buy’ button, which we did, knowing full well that it was an April Fools’ prank, with the eternal child in us hoping to be pleasantly surprised, Think Geek doesn’t let you down easily. The site also gets extra brownie points for its use of an image of Gene Wilder as Willy Wonka, another staple in the life of any geek child of the 80s. With LoveFilm’s growing popularity, the Amazon-owned streaming service has come out with a forward thinking approach to its content – perfectly suited for the 140-character consuming Twitter generation. 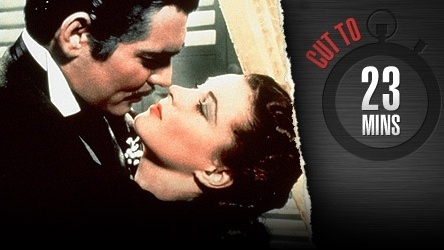 Distributors must now supply both a standard and “an abridged edit of each motion picture, lasting not longer than 23 minutes”, for any film slated for release in the US or UK markets. This mandate is purportedly designed to bolster cinema’s ability to compete with the growing influence of short-form television. Witnessing an increasing popularity in TV shows and short-form entertainment, LoveFilm is introducing the Cliff Notes version of its films. With the iPad dominating the tablet market, Toshiba might have just hit on something that is pure genius, that we’re all left thinking, why hasn’t anyone thought of this before. 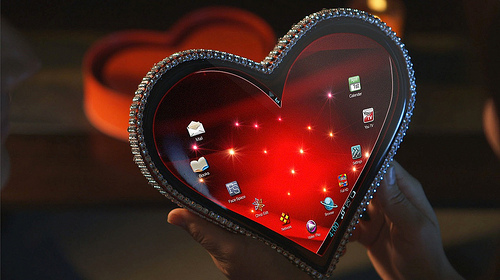 Introducing Shapes by Toshiba, a new and exclusive line of tablets designed to match your personality and style. While the April Fools’ prank is obvious, some commenters don’t think Toshiba has gone far enough, expecting more from a corporation. We still think Toshiba did a pretty good job, and the only question that remains is, which shape are you? Online ads can be a little bit annoying, but more annoying than cat pictures? We think not. That’s why Adblock for Chrome’s April Fools’ prank is pure genius – taking one Internet annoyance away, and simply replacing it with another. If you use the Chrome extension to get rid of online ads, you might have caught sight of your fair share of cat photos. Of course, it’s just as easy to disable to feature and go back to a clean, ad-free atmosphere online. Wow, um, there’s a lot more demand than I expected for CatBlock to not disappear. So how about this: vote with your dollars. 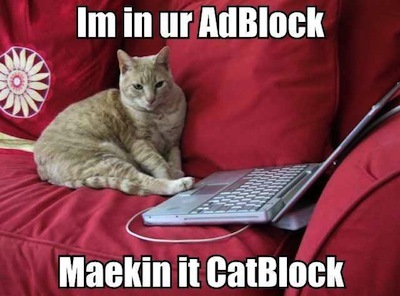 I will make a standalone version of CatBlock and email you when it’s ready if you will support AdBlock with a monthly payment. CatBlock doesn’t have to die! Have you spotted any hilarious April Fools’ pranks around the Web today? Let us know about them in the comments.